After Niagara, we spent a few days exploring the city of Toronto. 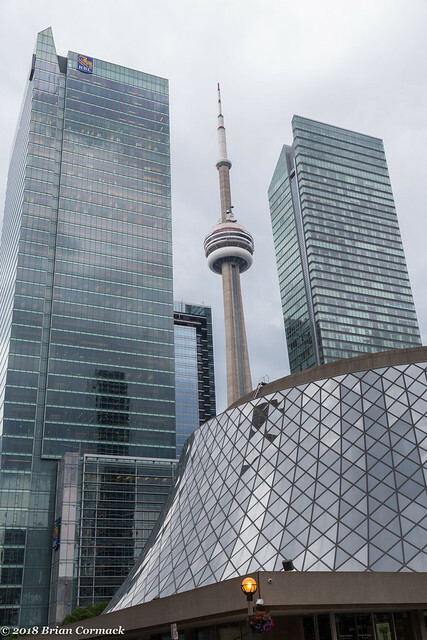 With a population of about 2.7 million, Toronto is the largest city in Canada. It’s also described as being one of the most multi-cultural cities in the world. 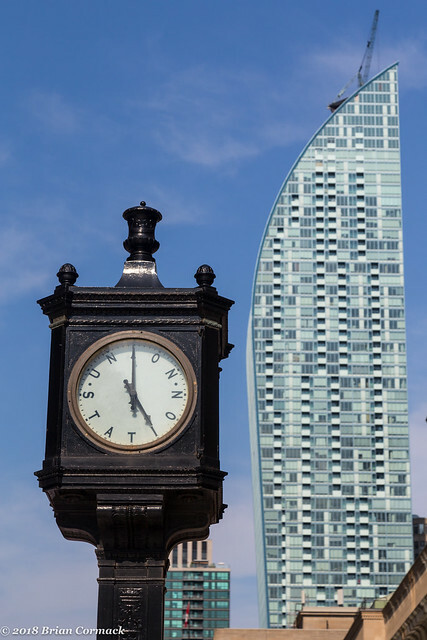 We were staying downtown, just off of the always busy Yonge Street, but we did manage to visit a few other neighborhoods in the city. It was a fun trip, but honestly it was just refreshing to take a little break from US politics and spend a few days in a country that is much saner at the moment. 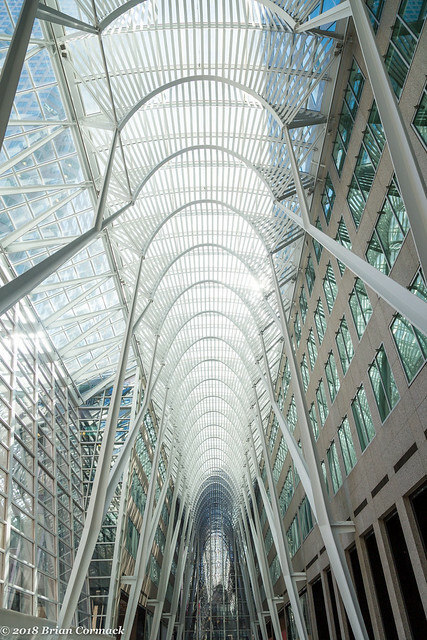 One of the first places we visited in downtown Toronto was the Allen Lambert Galleria, which is descrbed as the “crystal cathedral of commerce.” It’s a large shopping center with a parabolic arched roof that was designed by the architect Santiago Calatrava (who also designed the new train station by the World Trade Center in New York). 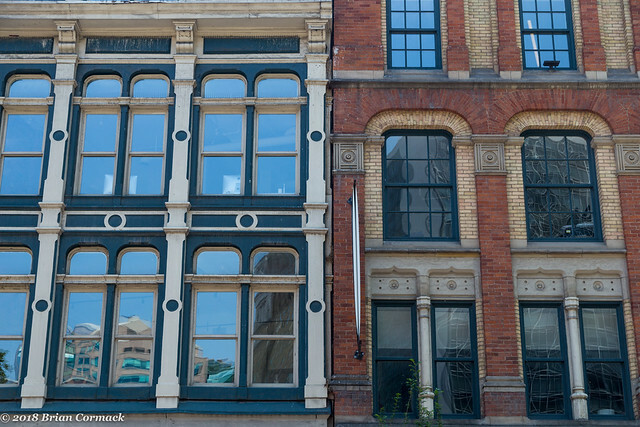 I liked how the design incorporated some historic buildings. The shopping center felt Canadian – it had a Tim Horton’s, a Roots store, and it was right next to the Hockey Hall of Fame. 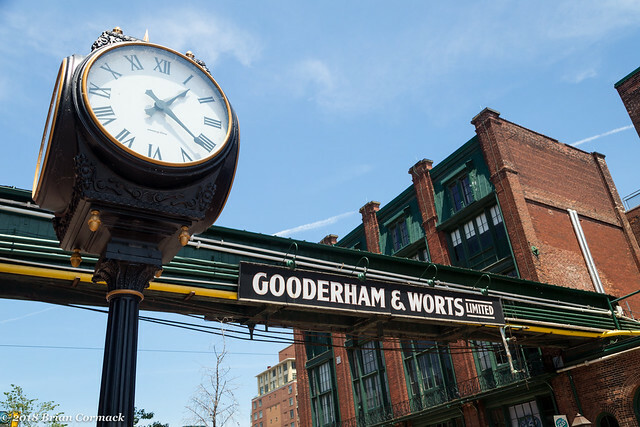 Another stop was the Distillery District, which as the name suggests was once the home of the largest distillery in the world. 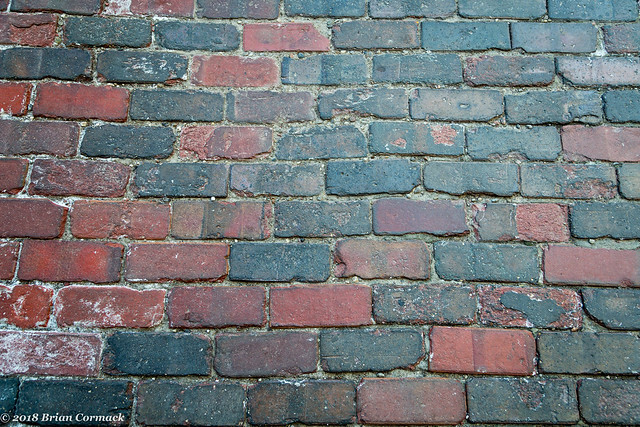 The first whiskey distillery opened here in 1832, and it soon grew large enough to produce over two million gallons of whiskey per year (mostly to the US during Prohibition, thanks Canada!). 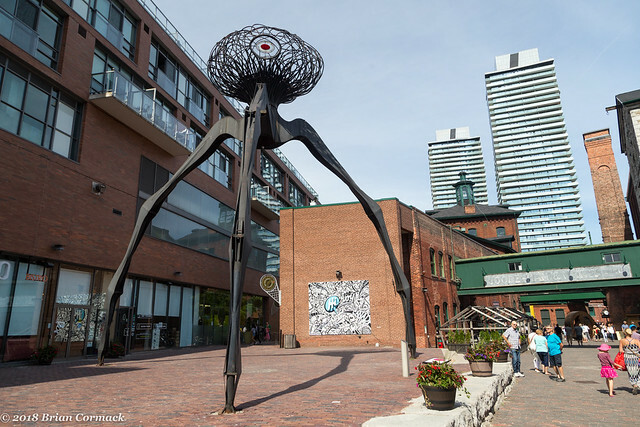 The Distillery District is now home to 13 acres of historic buildings, including the largest collection of Victorian-era industrial architecture in North America. The buildings in the district were renovated and repurposed, and are now home to all sorts of eclectic shops, boutiques, galleries and artist's spaces. There is a good microbrewery there, and even a Mexican restaurant that was amazing (one of the best dishes I’ve ever had at a Mexican restaurant was at this place in Canada. The cheese dip, however, was fairly lackluster). 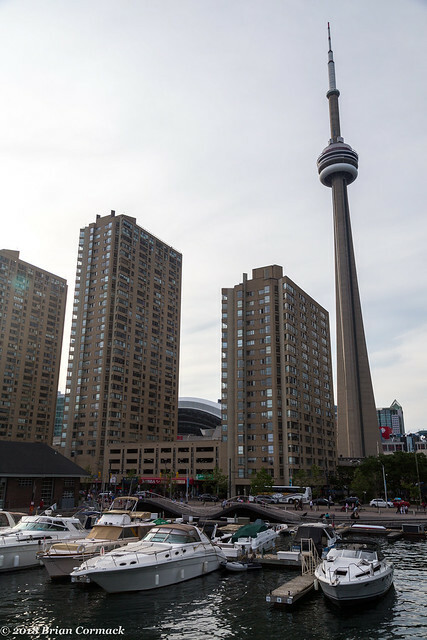 Later on we visited the Harbourfront area and went to a place for drinks, which got really busy with people streaming in after the Toronto Blue Jays game. But it was by this nice view looking towards the harbor and the CN Tower. Another day, we went and walked around the Old Town. 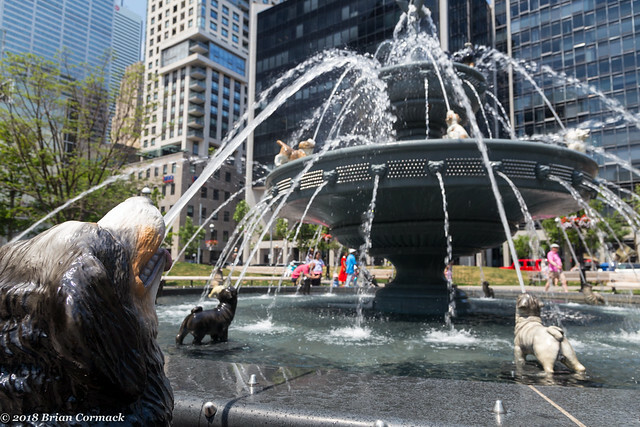 One of the definite highlights was this large two-tier fountain in Berczy Park that features 27 life size sculptures of dogs (and one cat). I’m sure our two pups back home would have appreciated it. 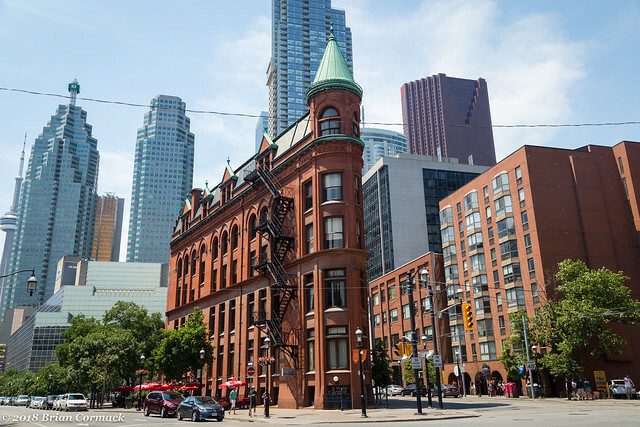 The park is also right by the Gooderham Building - the Flatiron Building of Toronto. 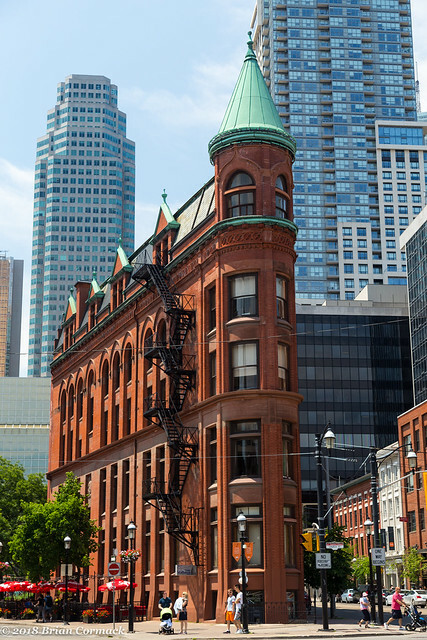 The Gooderham was built in 1882, and is one of the iconic buildings in the Old Town area. 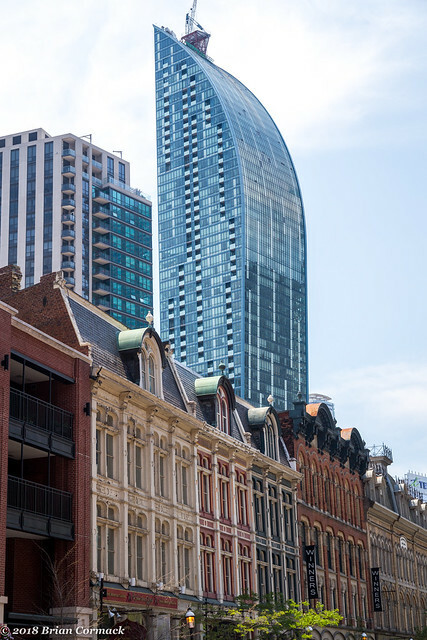 The modern buildings of the Financial District tower over the Gooderham and the other old buildings along Front Street. There is a pretty eclectic mix of architecture here. 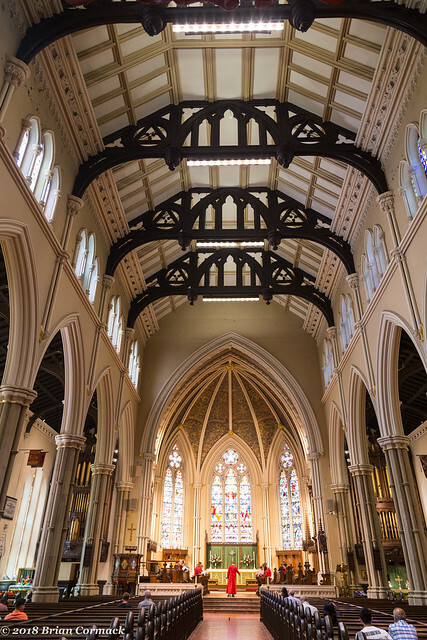 From there we wandered over to the Cathedral Church of St. James, which opened in 1853. 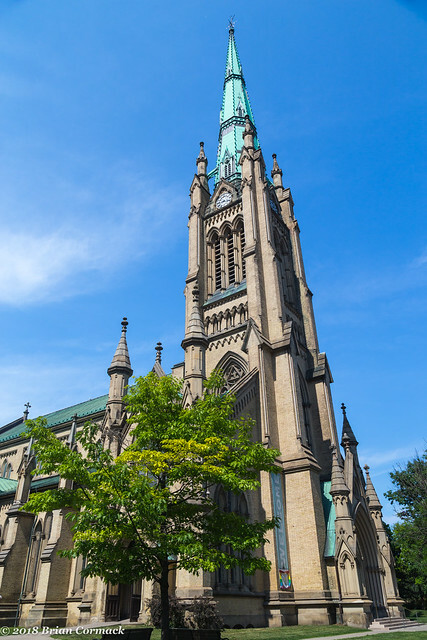 The cathedral’s tower and spire were not completed until 1874, making it the tallest structure in Toronto and also Canada. It held that distinction for 25 years. 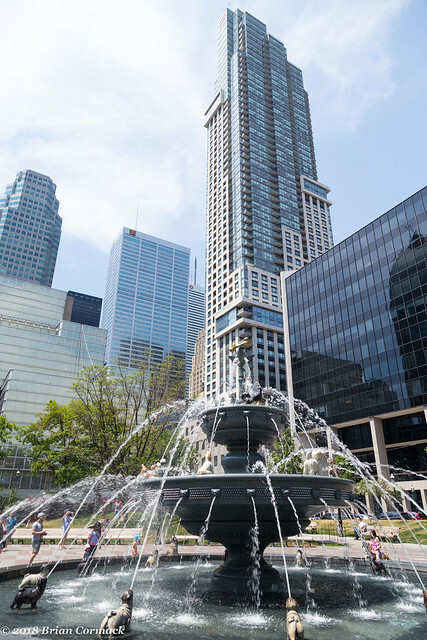 And while there are much taller buildings in Toronto now, the cathedral still boasts the tallest church spire in Canada, and it's among the tallest church spires in North America. And a view of the interior, where the choir was practicing. 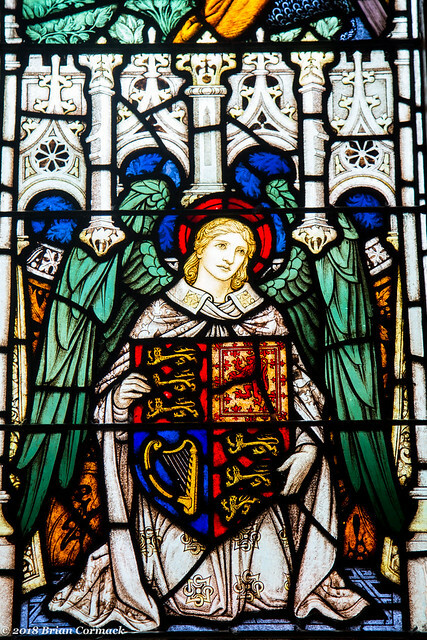 And some stained glass inside the church. We headed back out and walked out of the Old Town, and then headed past the glass towers of the newer downtown. 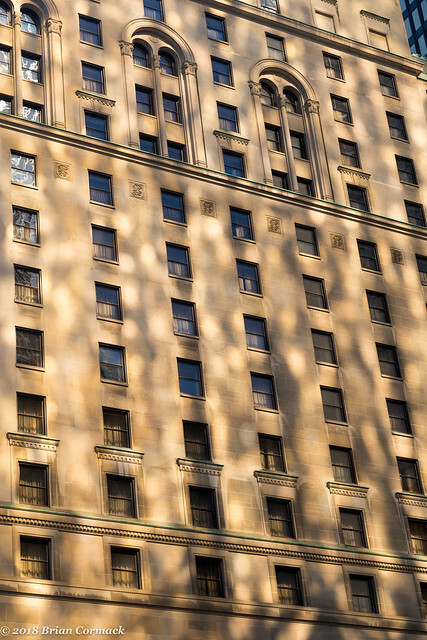 This is the view of the Dominion Public Building, which was completed in 1935. 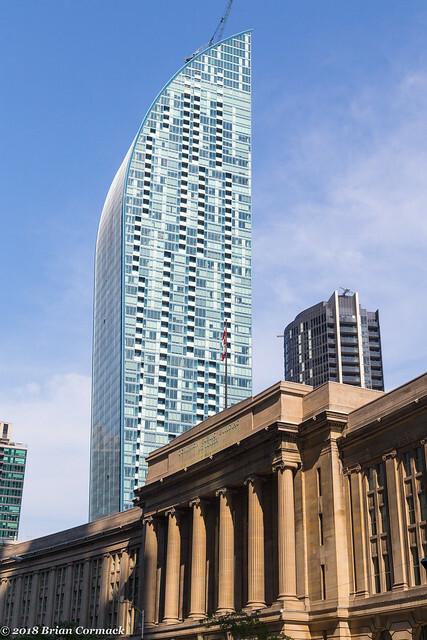 Towering above it is the 58 story L Tower, which was built in 2015. 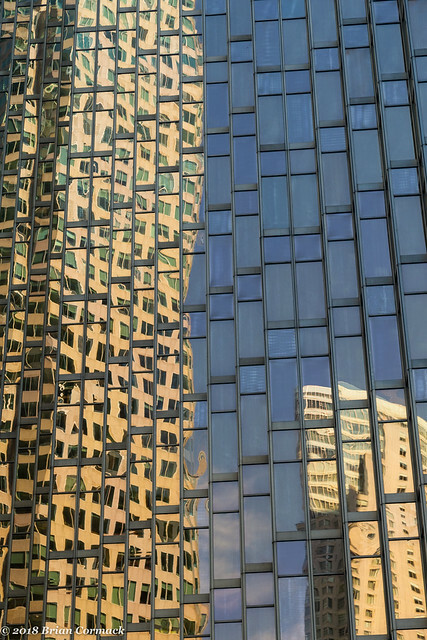 It was starting to get late in the afternoon, and the sun was reflecting off of the glass towers and bouncing back onto the other buildings nearby. 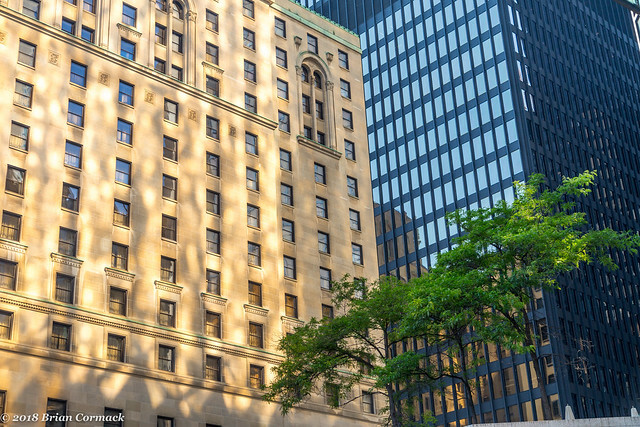 I think the older building here is the Royal York Hotel. 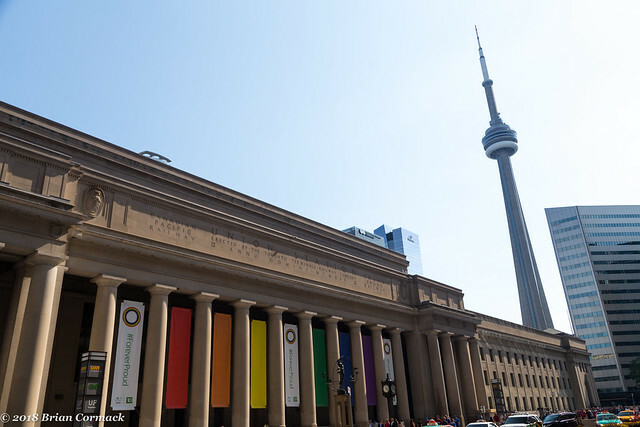 Next we headed across the street to Union Station, which is the largest train station in Canada. 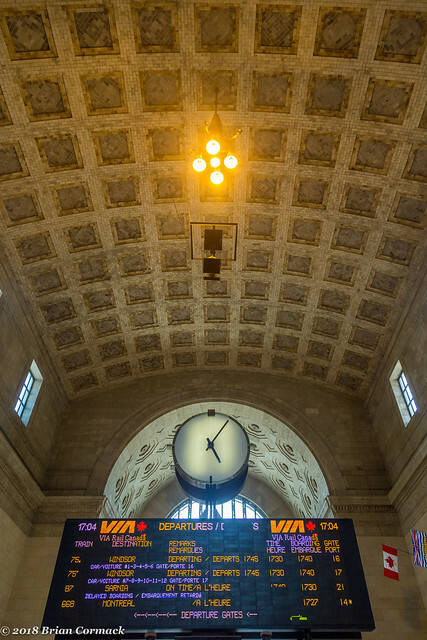 The station sees more than 250,000 people a day, many of whom are passing through on Toronto's inter-city rail service. 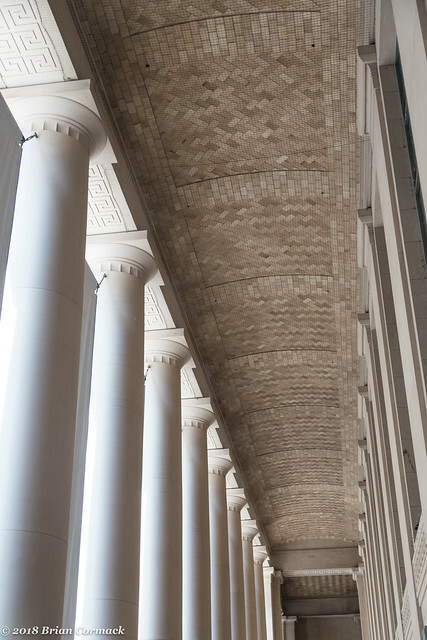 The exterior of the station is dominated by 22 Roman Tuscan columns, which are each 40 feet tall and weigh 75 tons. Inside the station is the massive Great Hall and Ticket Lobby, which runs 250 feet long and 88 feet high. Carved just below the cornice are the names of Canadian destinations that were serviced by the station when it was built, stretching across the country. Since this happened in the days before spellcheck, the people who carved the names of the cities accidentally misspelled one - Sault Ste. Marie. On a different day, we did more walking through downtown Toronto. 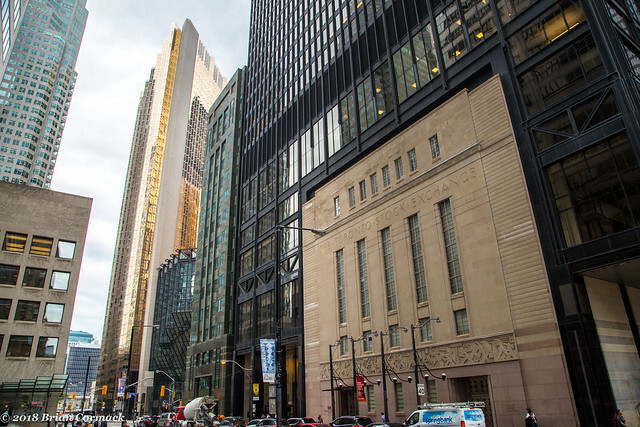 At one point we passed by the old Toronto Stock Exchange Building, which was built in 1937. 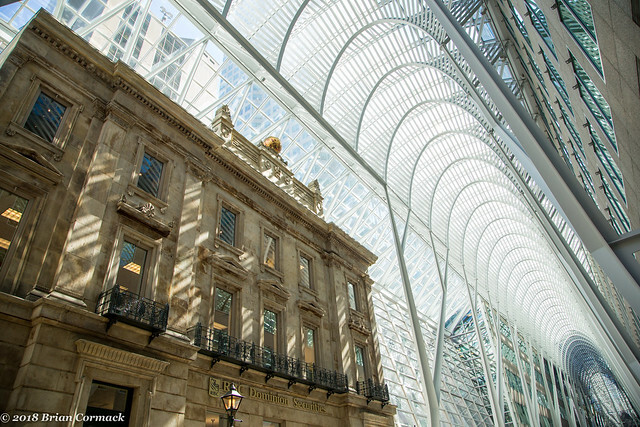 The stock exchange has since moved into a more modern location, and the old building is now home to the Design Exchange, which promotes arts and designs by Canadians. But it is interesting how the modern skyscraper was built up and around the old building, like a Tetris piece sliding into place. It started to rain on us as we walked closer to the CN Tower. Although we didn't go to the top, we did walk by the base of the Tower. 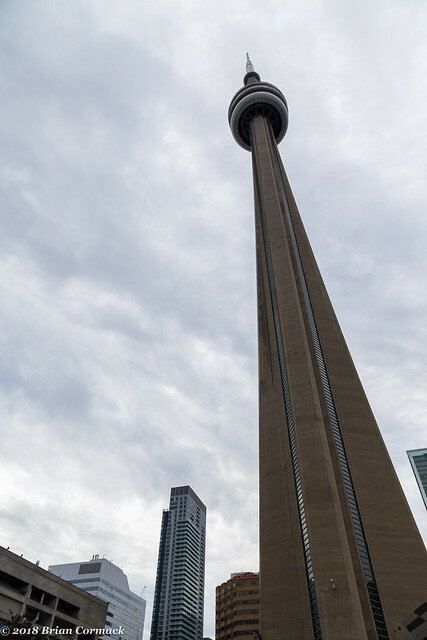 The CN Tower opened in 1976 and stands 1,815 feet tall. It held the record as the world's tallest structure and the world's tallest tower for a few decades. It is now the ninth-tallest structure in the world, and it still holds the rank of the tallest free-standing structure in the Western Hemisphere. And while we didn't make it to the top of the CN Tower, we did make the most of our visit to the area by visiting the Steam Whistle Brewery. The brewery makes just one beer, but it is a pretty good beer. We went to grab a pint, but it was crowded and there were no tables open. One table only had one guy sitting at it, and he was kind enough to invite us over and offered to share the table with our group. We got to talking to him - he was visiting Toronto from Mexico. He told us his story, which including him flying in to meet some friends here. But those friends were too caught up watching the Mexico-Germany World Cup game that they managed to forget to pick him up at airport. Since Mexico won that game, he didn't seem too bothered. But while we were talking he went to drink his beer and got choked, and then managed to spit a mouth-full of beer out on everyone at the table (which was like one of those spit-takes that only happen in TV shows and movies). He felt really bad about it. 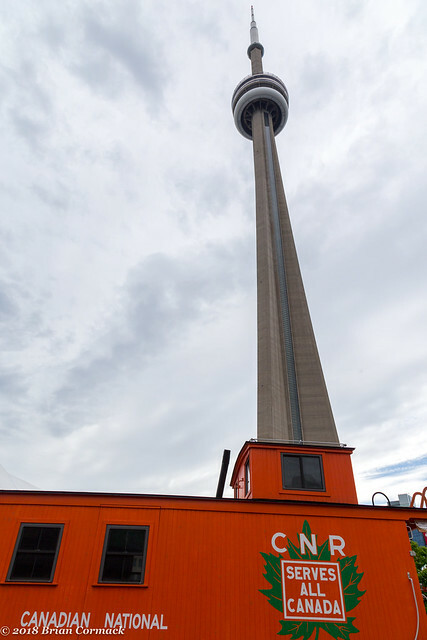 The brewery sits just below the CN Tower in the old roundhouse that was once used by the Canadian Pacific Railway. 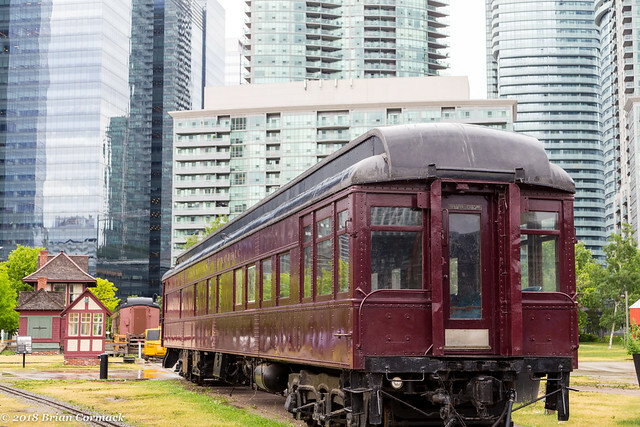 The building is also home to the Toronto Railway Museum, and there are several old trains sitting out on display. 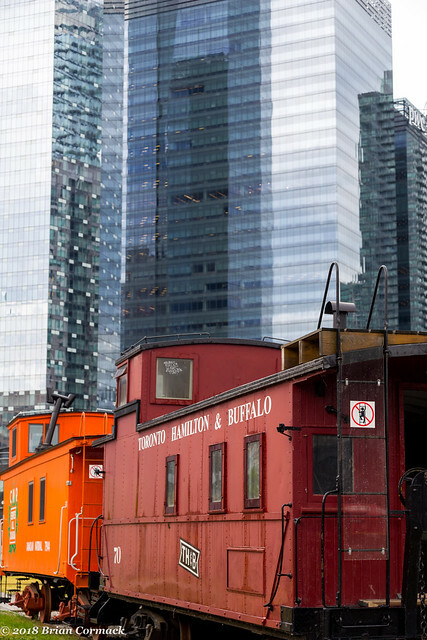 And one last shot, which I liked since it looked like the CN Tower was shooting out of one of the train cars. I'm still working on the pictures from the trip, including shots from the Toronto Islands. That visit was one of the highlights of our trip.